Opened one hundred years ago, Westminster’s impressive Methodist Central Hall was one of many buildings commandeered during WW2 for use by military commanders in need of a suitable base near the seat of government. 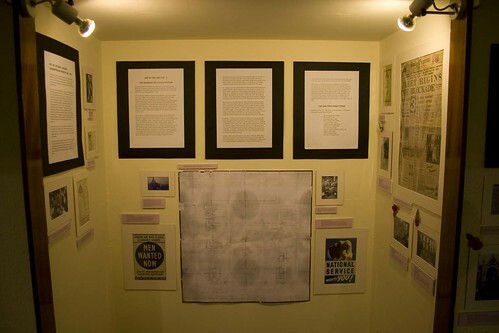 The basement though, was also commandeered — as a shelter for local residents during the blitz, and a small display has been set up in the basement again to remember life in the blitz for civilians sheltering from German bombs. Although only a basement, it had the advantage of being under a very substantial building which would have absorbed a lot of the impact of a direct hit — and the ceiling of the basement/floor of the hall was equally sturdy. Although the exhibition is mainly photos of war damage in the area, which are fairly commonplace in any history book about the Blitz, what makes this worth visiting are the memories written down of a couple of the people who used the shelter. From the nurse who seemed to think a dose of Detol would fix anything – down the throat or on cuts to talk about how close the bombs would come at times. “That was Victoria Street”, “They’ve got the hospital again”, and reminders that these shelters felt the war in a way which we struggle to imagine today – as the ceiling shook and lights flickered when bombs hit nearby. 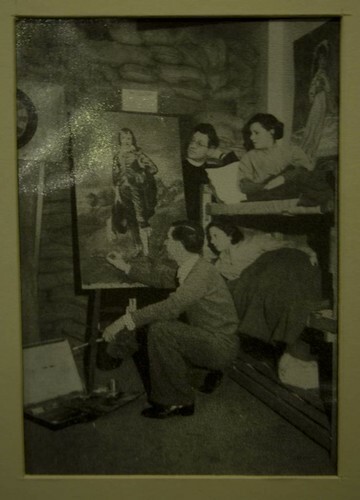 The basement was divided up into four dormitories using sandbags, and then decorated by the nighttime residents. Sleeping initially on the floor, and much to the evident disgust of the librarian, using library books for pillows –but bunk beds were added later as can be seen below (note the sandbag wall). A visit by an American senator caused much excitement – as none of the users of the shelter had seen a real life American before other than on films, so this was quite an exotic appearance. For three years the residents of Westminster slept here, and indeed so strong were the friendships formed, that some were unhappy when it closed. There are a collection of the usual war time posters which we have all seen before, but some which remind us just how precious materials were, with exhortations to recycle everything – even paper. When I am researching war records in the National Archives, it is not unusual to see military memos written on the backs of previously used stationary documents. I think though, the poster which was most instantly gripping was one reminding people that they need to make prior arrangements with friends in case their home is destroyed so they would have somewhere to sleep. With entire swathes of London being flattened by bombs, it is obvious in hindsight that people would club together to offer shelter to bombed out friends, but it wasn’t something I had thought about before. 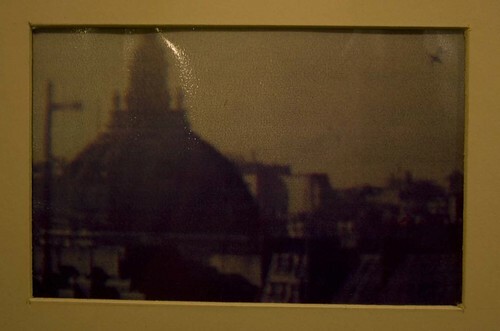 A blurry photo of the area, with the dome of the Hall in the foreground shows a V2 rocket V1 flying bomb falling to the ground. That’s a surprisingly rare thing to see on a photo, and only the second one I have ever seen. The exhibition is in the basement of Methodist Central Hall and is free (map link). I am not sure how long it is on for, as there is no mention of it on their website (and I forgot to ask when visiting). I was only made aware of the exhibition at all by a notice in the SubBrit mailing list. Do you mean a V2 rocket, or a V1 flying bomb? To me the shape looks like that of a V1, and I don’t think a V2 would show up that well on film. According to Wikipedia, a V2 would have been travelling at about 800 metres per second just before impact, so it would have travelled more than its 14m length during a 1/50 second film exposure. Given the quality of the print, I think that would have come out as a long, thin smudge (if anything at all). That is a V-1 Ian. A V-2 was a rocket that briefly left the Earth’s atmosphere and as the comment above says, was travelling at supersonic speeds when they struck their target. Good article though and looks like an interesting exhibition.